We are all different, not less. 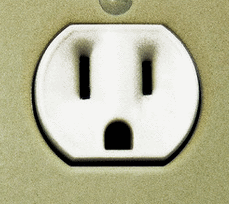 Can you see a sleepy koala bear and a shocked face when you look at these sockets or is it just me? Do you think this is a happy or a sad suitcase? Sorry if my questions have made no sense to you but most people, including me, seem to be primed to recognise faces in inanimate objects. I know that I instinctively add a layer of social story to the things and events I observe. I find myself constantly making up imagined and complicated back stories for my fellow commuters when I’m travelling to and from work. In order to keep the kids amused Nick and I used to really go to town with back stories about other families in neighbouring cars when we were in traffic jams on long road trips. I suspect the twins may actually believe that we were once in a ferry queue next to the handsome and extremely wealthy Prince Razis who had decided to try out life as a “normo” by hiring a VW van for a weeks camping holiday in Northern Ireland with his young bride and baby daughter. The chap was more likely to be a software engineer from Telford but our version of him was definitely more entertaining. Other families do this too, right? A few years ago Edward and I sat down and watched a Horizon Documentary which was presented by one of the UK’s leading experts in Autism, Uta Frith. If my memory serves me well, at one point in the documentary an experiment was shown where both autistic and non autistic adults watched a very short animation which involved a large triangle and a small triangle and a rectangle. 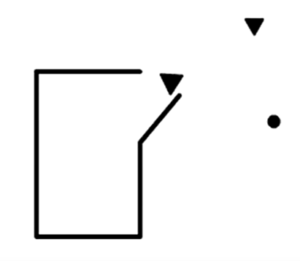 The shapes moved in relation to each other and viewers were asked to describe the story being depicted. I can’t access the Horizon episode now but I think the animation shown was similar to, but possibly not the same as, the one devised by Heider & Simmel, two research psychologists, in 1944. The Heider & Simmel animation is available on YouTube here. Uta explained that people on the autistic spectrum were more likely to stick to descriptions of how the shapes physically moved in relation to one another when asked to describe what was happening in the film clip. 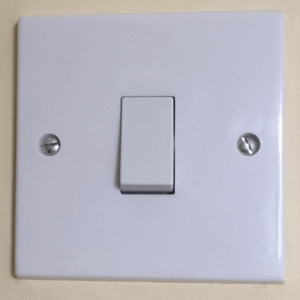 “The large triangle moves to the top right of the rectangle whilst the circle moves backwards and forwards inside the bottom third of the rectangle”. etc. Non autistic people were more likely to attach roles and meanings to the animation with shapes becoming personified and a story involving humanistic interactions would usually be forthcoming. Uta then told viewers that because people are primed to see social behaviour and purpose even in the movement of geometric shapes most people would have clearly seen a mother and child having a disagreement about where the child should play. Edward turned to me and was dumbfounded. He honestly looked at me as if I was a living genius. It’s the only time in my life when I remember him holding me with that regard. He was completely in awe of my ability to make sense of something that made absolutely no sense to him whatsoever. It was quite nice to have the tables turned. You see Edward has a brilliant memory and can understand, store and retrieve all sorts of complex pieces of information. I don’t even come close to matching Edward in these skills. As a young child Edward would repeatedly ask me, “Tell me something that I don’t already know.” I soon ran out of things to tell him which he was also interested in learning about. At one point I even ended up teaching him phonetics which I’d studied at university and for a while afterwards I’d hear him making weird vocal sounds from his bedroom in much the same way as I had done whilst trying to learn the subject as an undergraduate. One day, despairing of my inability to divulge any new information he asked me, “Mum would you say you were of average or below average intelligence?”. He wasn’t being intentionally rude he simply couldn’t believe how limited my ability to recall factual information was. When I told him I was probably of above average intelligence he looked genuinely shocked, surprised and then I think he then moved swiftly into a position of worry about the state of humankind. You’ll therefore appreciate just how wonderful it was for me to bask in the temporary glory of being viewed as a genius by my own son. The world needs humans who are diverse, who think different thoughts and who have different skills to offer. After all human progress would come to an abrupt stop if we were all the same. 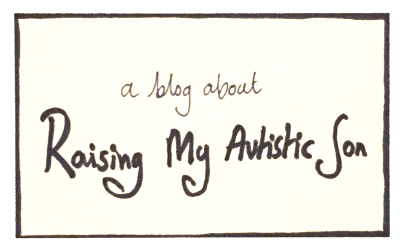 It can so often be the case that our autistic children are pathologised and everyone involved becomes overly focused on the things which they find difficult. It is of course important to try to help our children develop new social skills and learn compensatory strategies for the things they find challenging but it damages them if this intervention and attention is delivered at the expense of failing to fully recognise, celebrate and nurture them and their strengths. My son couldn’t tell you a convincing social story based on watching some moving geometric shapes. Unlike my son, I couldn’t tell you about all the candidates who stood in the recent French election or about all the latest developments in green technology. The featured image of the lego characters is used with permission from flickr common creative.